Adam Johann Reichert, a native of Norka, was one of leaders of the Autonome Sozialistische Sowjetrepublik der Wolgadeutschen (Autonomous Soviet Socialist Republic of the Volga Germans) which was established in the 1920's. 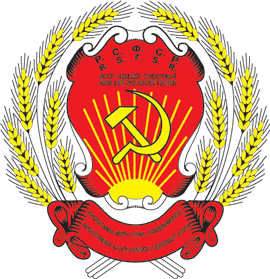 Coat of Arms of the Autonomous Soviet Socialist Republic of the Volga Germans. Source - Wikipedia. Reichert was born in 1869, the son of a teacher. In his childhood, Reichert's family moved from Norka to live in Georgia (at that time part of the Russian empire). He graduated from the parochial school in Tbilisi. He later passed the required examinations to become a teacher in rural Saratov province. From 1890 to 1917, Reichert worked as a teacher in the county of Novouzensk. In October, 1917 he became the head of the department of adult education. Reichert served as the Commissioner of Agriculture in the Commissariat for Volga German Affairs (1918) and as the Chairman of the Central Executive Committee of the Volga German Republic Workers' Commune from March 1919 to February 1920. During his time as Chairman of the Central Executive Committee, Reichert advocated a moderate approach to surplus grain deliveries. On February 21, 1920, he was arrested on charges brought by the regional Cheka (the security arm for the Bolshevik government) for disrupting grain deliveries and "protecting the interests of the kulaks." He was released from imprisonment later that year. From 1921 to 1923 Reichert served as Chairman of the Executive Committee of the Governing Board of Canton Kukkus (Volga German Republic Workers' Commune). In 1923, Reichert traveled abroad as an authorized representative of the Volga German Agricultural Credit Bank (Nemvolbanka). From 1923 to 1925 Reichert served as Chairman of the Executive Committee of the Governing Board of Canton Balzer (Volga German Republic Workers' Commune). Reichert also served as the editor of the German language newspaper Nachrichten (News) and the newspaper Трудовая правдаfrom (Labor Truth) from 1925 to 1930. In 1930, due to infirmities (complete deafness) Reichert retired from political activity and moved into the village of Laub where he once taught as a schoolteacher. He worked as a foreman on a kolkhoz (collective farm) that bore his name. Adam Johann Reichert, teacher, journalist and kolkhoznik, died in 1936. Information courtesy of Alexander Schreiber, a resident of Moscow, who translated this excerpt from the book, The State National Policy of the Volga German Republic - 1918-1941, by V. G. Chebotareva. Moscow, 1999, p. 111-113. Herman, A.A., German Autonomy on the Volga - 1918-1941. Ed. 2nd. M.: ICSU-Press, 2007. Memories of Adam Reichert were published in the German language newspapers Freundschaft (№ 24, March 31, 1979) and Neues Leben (May 31, 1977). Last updated April 21, 2016.